As animals live longer thanks to veterinary medicine, they’re experiencing the same issues many people face, from arthritis to dental issues. That’s what happening with Ramar, a 49-year-old western lowland gorilla at Brookfield Zoo in Brookfield, Ill. At his recent checkup, the veterinary team at the Chicago Zoological Society (CZS), which operates the zoo, discovered a mild periodontal disease affecting several of Ramar’s molars. Since Ramar required follow-up care, the CZS team decided to treat both the periodontal disease and Ramar’s age-related degenerative arthritis in his knees. This required the assistance of a board-certified veterinary dentist along with an orthopedic surgeon to join the CZS team. First was Stephen Juriga, DVM, AVDC, of River Heights Veterinary Hospital of Oswegok, Ill., who assisted in treating Ramar’s periodontal disease. Mukund Komanduri, MD, FAAOS, CIME from MK Orthopaedics MD in Joliet, Ill. aided the veterinary team with Ramar’s arthritis. Ramar received a treatment of injection of a synthetic joint lubricant and platelet rich plasma, which have helped people with similar conditions. It’s not unusual for human doctors to help out with surgeries on great apes. 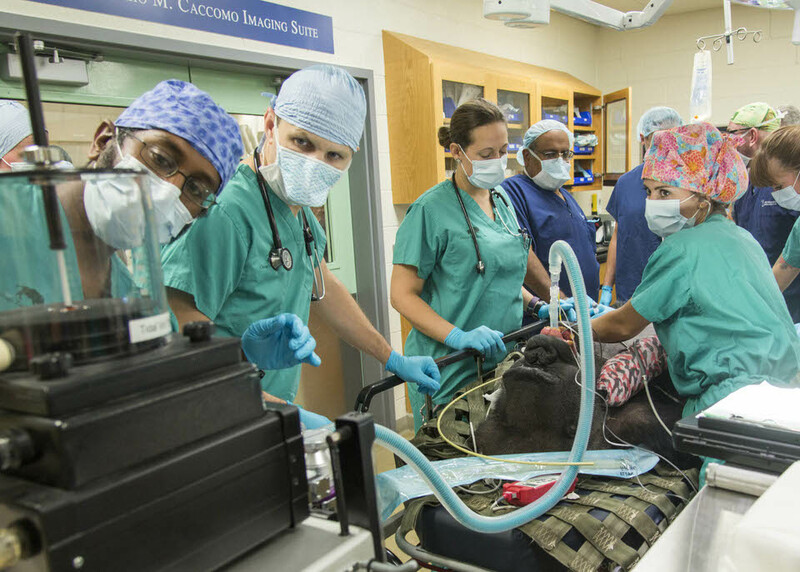 Earlier this year, doctors helped veterinarians deliver a baby western lowland gorilla in Philadelphia. Ramar is the oldest animal at Brookfield Zoo, and one of the oldest western lowland gorillas in the population in North American zoos too. As a critically endangered species, Ramar’s life at the zoo helps promote conservation and education about these animals. The longer they live, the more they can benefit from human medicine too, such as with his arthritis treatment.